Here's Europe's take on the all-American Z06 Carbon 65. The with the unveiling of the all-new model. It arrived packing a 6.2-liter supercharged V8 LT5 producing a monstrous 755-hp, making it the fastest and most powerful Corvette ever made. If, somehow you're still craving more power German tuner GeigerCars has revealed a custom track-ready Corvette that’s even more potent than the new ZR1. Based on the , the tuner has cranked up the sports car’s 6.2-liter supercharged V8 to a whopping 759 hp and 729 lb-ft of torque. Revealed last year to celebrate the Corvette's 65th anniversary, the Carbon 65 Edition was already extensively clad in carbon fiber as the name suggests, but GeigerCars adds even more of the lightweight material to shed some extra weight. 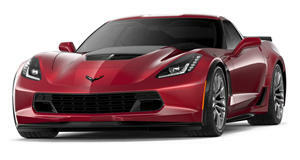 A new body kit features visible carbon fiber, a front spoiler for the Corvette’s aggressive nose, a revised front grille enhancing the air flow, and new air intakes. Geiger’s sub-frame with an integrated diffuser also makes the Corvette’s rear look larger. Buyers can choose from three rear spoilers, including a subtle flat version designed for road use for more top speed and a more aggressive purebred racing spoiler. To boost the Corvette’s power, GeigerCars replaced the factory-installed 1.7-liter Eaton supercharger compressor with a more powerful 2.3-liter screw-type compressor and also modifies the throttle valve, intake system and the engine’s software. The stock eight-speed automatic or seven-speed manual haven’t been changed. As a result of the modifications, the 759-horsepower Corvette Z06 Carbon 65 Edition can do 0-62 mph in 2.9 seconds and hit a top speed of 209 mph. The modifications have been implemented with track-use inside. As such, the tuner installs a four-point racing harnesses and a Heigo roll bar. Modifications to the powertrain cooling systems also optimize the supercharger, thus making the car more reliable for lapping a circuit. Revised suspension knuckles also lower the ride height, and the tuner added more powerful brakes to improve the car’s stopping power when taming it on the track. Rounding off the modifications is a set of HRE wheels wrapped in either Michelin Pilot Super Sport or Pilot Sport Cup 2 tires. GeigerCars sells the standard Z06 Carbon 65 Edition for 136,000 euros ($162,250), but the cost soon mounts up once you start adding all the upgrades - the carbon fiber bodykit costs 9,600 euros ($11,500) alone.